An ideal 7th anniversary or Valentines gift. 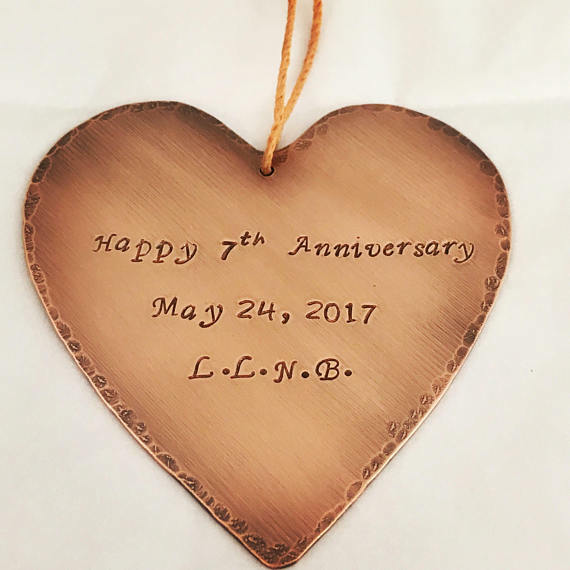 This plaque is cut from thick copper sheet in to this heart shape. It has a textured edge and can be personalised with your own message, please enter your requirements in the personalisation tab. Measuring approx 3" x 3" it hangs on a piece of cord and will be treasured forever. Your Personalised Copper Plaque will be handmade to order and will be dispatched within 2 weeks by special delivery (£2.99). We will notify you by email when your item has been dispatched.